Welcome to Castella Beach Hotel ! The Castella Beach Hotel located 18 km west of Patras and 20 km from the ARAXOS airport, in a verdant area by the sea. The hotel's family atmosphere, combined with the local Greek cuisine of our restaurant and Greek hospitality, makes it ideal for relaxing holidays. From our hotel, visitors can go on daily trips to nearby archaeological sites, such as ANCIENT OLYMPIA-DELPHI-KALAVRYTA and EPIDAURUS, or to famous beaches, such as KALOGRIA and GIANISKARI. The fishing village of ALYKES, where you can eat fish freshly caught by the village's fishermen, is just 3 km away. Activities near the hotel include PARAGLIDING in SANTOMERI and OMBLOS and climbing in MAVRA VOUNA KALOGRIA. The hotel offers 20 rooms (double, triple, quadruple). Most look out to the sea and the city of Patras. Paid transport can be arranged from the airport, upon request. 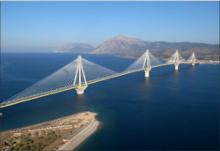 Finally, as it is close to the industrial area of Patras (8 km), it is ideal for professionals and business executives. Contact us for our special prices for business representatives. The Castella Beach Hotel located 18 km west of Patras and 20 km from the ARAXOS airport, in a verdant area by the sea. The hotel's family atmosphere, combined with the local Greek cuisine of our restaurant and Greek hospitality, makes it ideal for relaxing holidays. 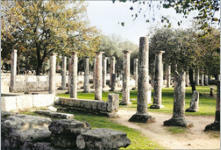 From our hotel, visitors can go on daily trips to nearby archaeological sites, such as ANCIENT OLYMPIA-DELPHI- KALAVRYTA and EPIDAURUS, or to famous beaches, such as KALOGRIA and GIANISKARI. The fishing village of ALYKES, where you can eat fish freshly caught by the village's fishermen, is just 3 km away. 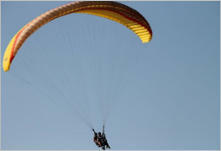 Activities near the hotel include PARAGLIDING in SANTOMERI and OMBLOS and climbing in MAVRA VOUNA KALOGRIA. The hotel offers 20 rooms (double, triple, quadruple). Most look out to the sea and the city of Patras. Paid transport can be arranged from the airport, upon request. Finally, as it is close to the industrial area of Patras (8 km), it is ideal for professionals and business executives. Contact us for our special prices for business representatives.